“Fiber Fusion” Call for Entry! We will be releasing more information as quickly as possible, but hope this will get you thinking, creating and making now! We’d also love to get some more input and ideas from our members. Areas we’d like some help include: PR/Marketing, Budget/Fund-Raising, Managing Entries, and Educational Opportunities. If you’re available, please contact our WA State Rep: Barbara Matthews or Exec. Director of the Exhibition, Christina Fairley Erickson. 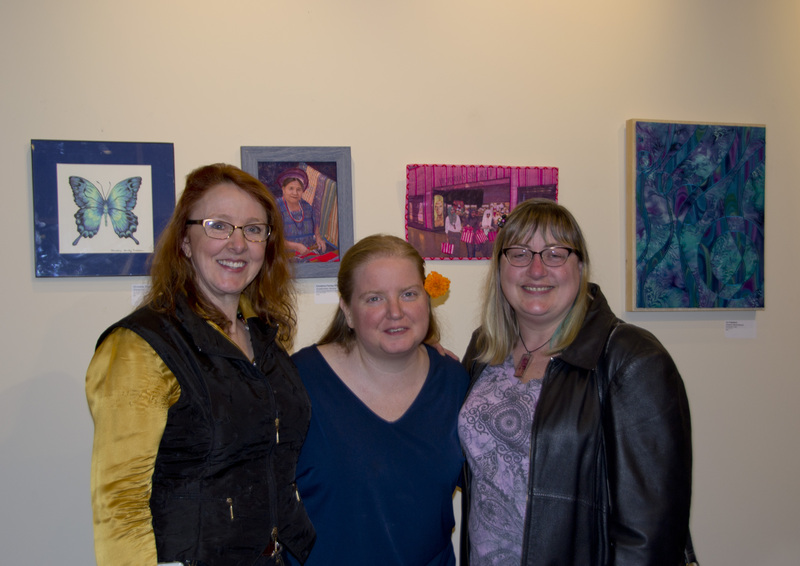 Artists Christina Fairley Erickson, Crystal Edwards, and Rebecca Wachtman at the exhibition opening. FANTASY, the 2nd Annual SDA [Surface Design Association] Eastside group exhibition is on display during the month of October 3rd – 31st in the North Gallery at Vision 5. 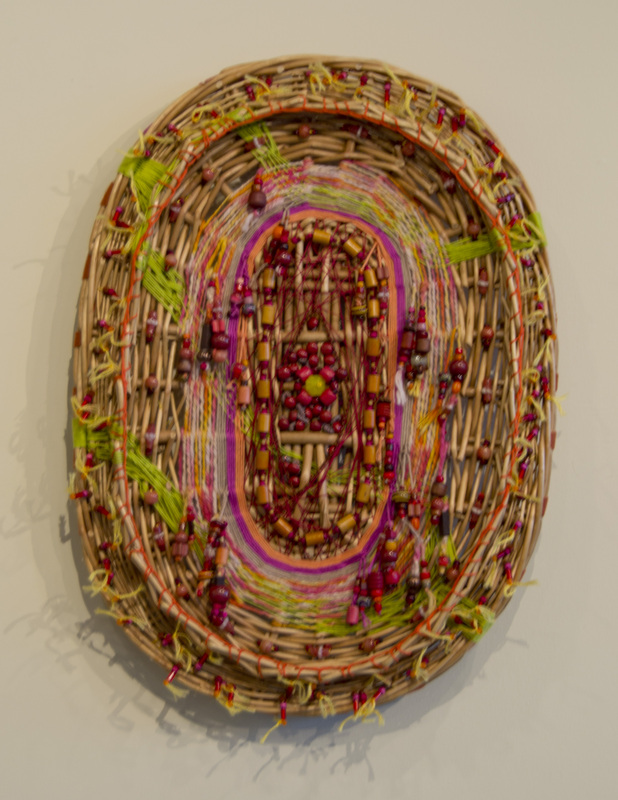 This 20 piece exhibition of is designed to build awareness of fiber art in our community. The selected fiber artwork is chosen for its ability to lead the viewer into contemplation of fantasies, and its ability to act as a spark for the viewer’s own creativity. 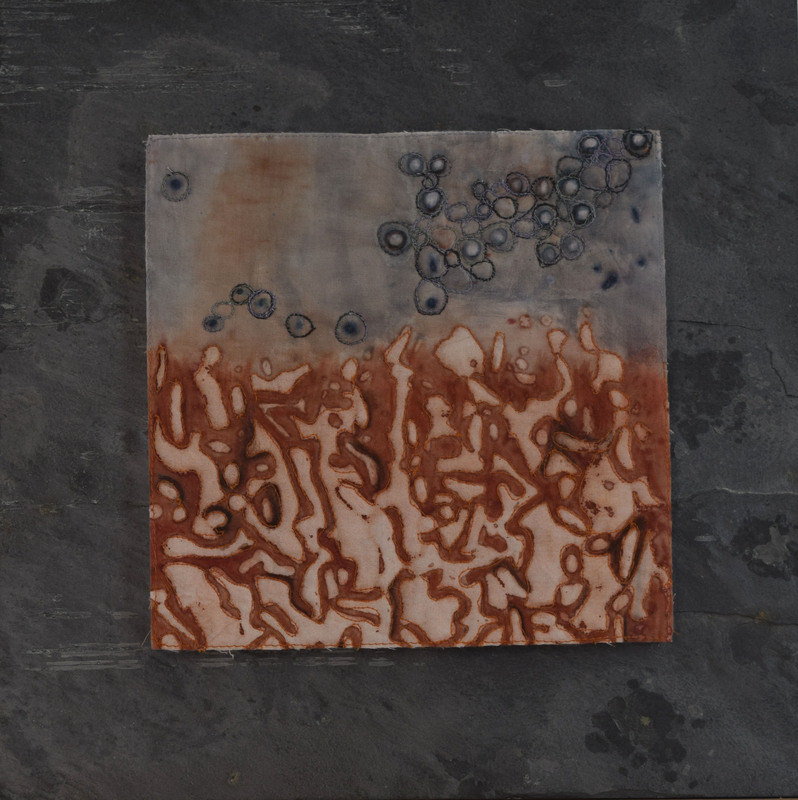 The diversity of the work showcases a small selection of the vast array of that is Surface Design. 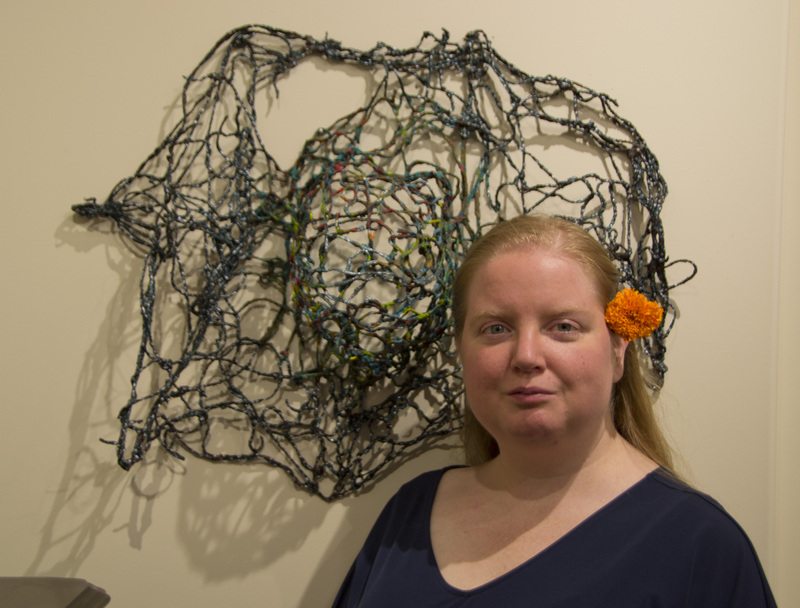 Curator Crystal Edwards with her piece “Galaxy” made from painted yarn. 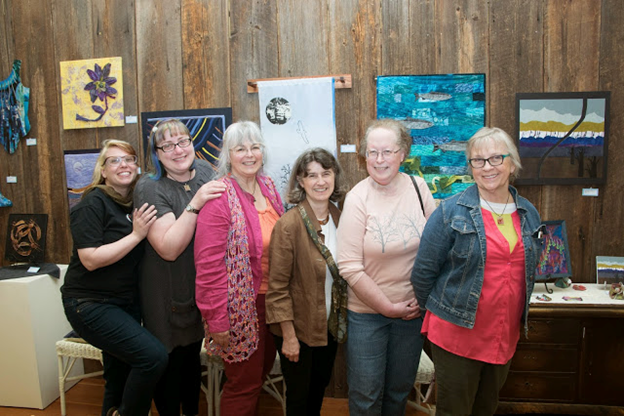 SDA Member, Crystal Edwards has put together this group show, featuring the work of 6 Eastside SDA members: Liz Copeland, Maura Donegan, Crystal Edwards, Christina Fairley Erickson, Louise Roby, and Rebecca Wachtman. There will be an Artist’s talk at the Eastside SDA meeting on Sunday, October 11th from 2- 5pm. It will feature and open discussion with artist and guests about the artwork and its creation. ALL SDA members and guests are welcome to attend. Vision 5 is open to the public from Mon-Friday 9 am – 5 pm and Saturday from 9 am – 3pm. 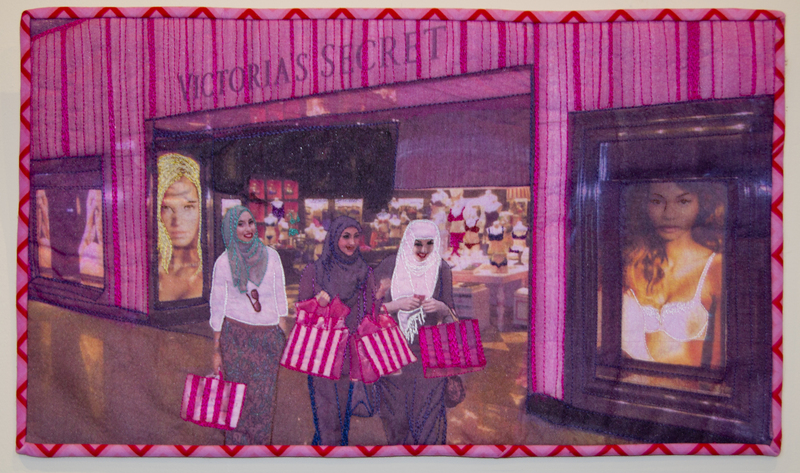 “Hijab Misconceptions” by Christina Fairley Erickson. Made to reveal the misconceptions that Western women have about women who wear the Hijab… the idea that Hijabi’s wouldn’t like Victoria’s Secret as much as a woman who isn’t covered. 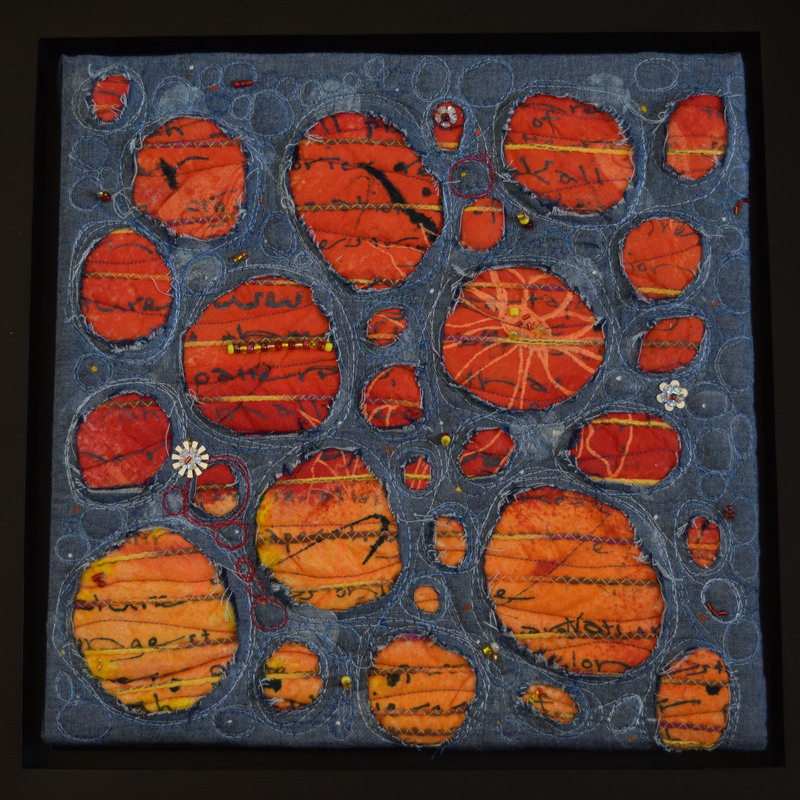 “Frayed Holes” by Deb Taylor – 2015. Chambray fabric, painted cotton batting, screen printing, quilting, beads. 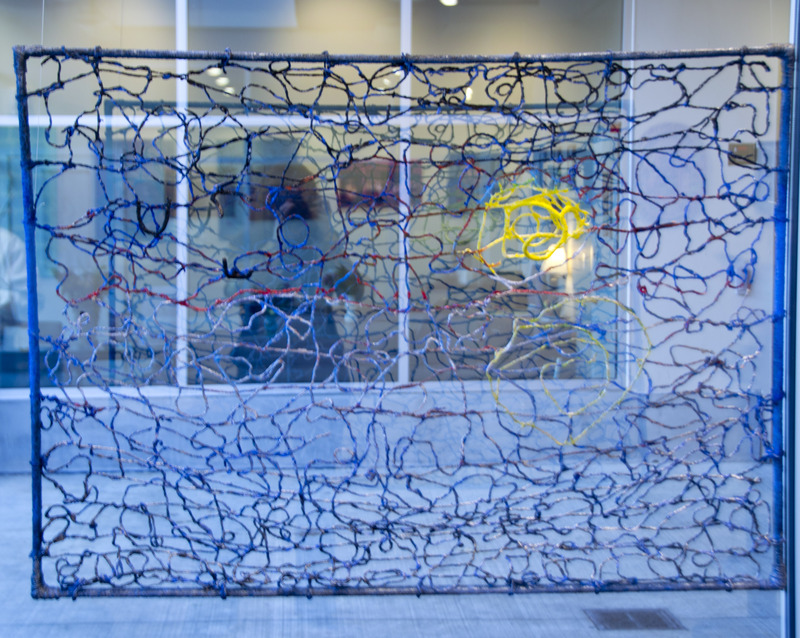 The work is a later addition to the Fiber 19 group Beyond Blue collaborative project. 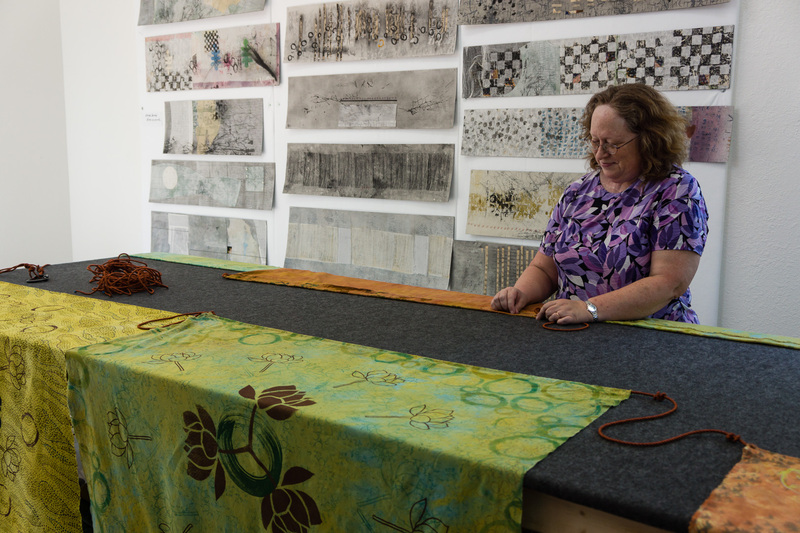 It is with heavy hearts many of us in the SDA community heard of the passing of Deb Taylor, fiber artist, teacher and friend. The following are some memories and images of Deb and her work contributed by SDA members. I met Deb in an independent study class lead by Jane Dunnewold. By way of introduction, Jane had us tell two truths and a lie to the group. We were to guess the lie. I thought my 3 triathlons would trip people up. Before the intros got to me, Deb trumped me by saying she had done 8 triathlons (surely she could not have done that many–I thought she was exaggerating!) but she had! She had done the Danskin triathlons as a cancer survivor no less. We connected because I think we both felt a little out classed by others in the study group. We started meeting weekly to show our progress on our art and get suggestions. 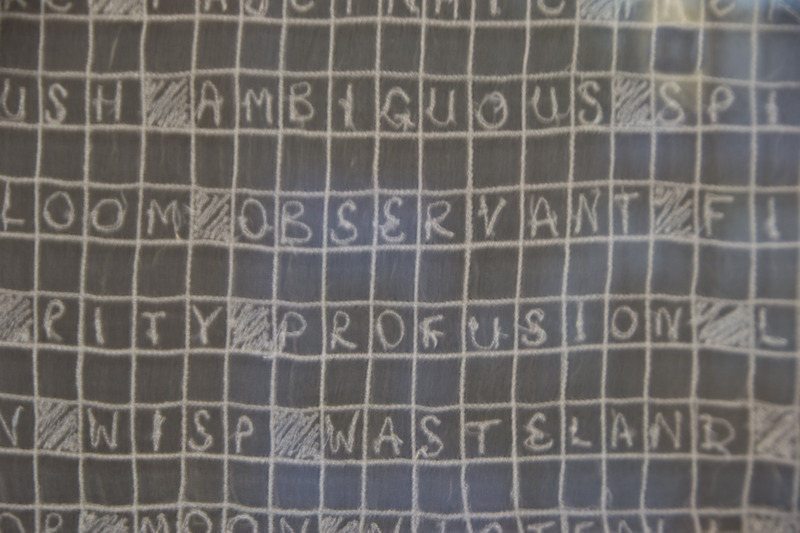 We were the yin and yang in doing art–her willing to play with any media; me more methodical in my thinking. She would gently chide me to play more. She was fearless and seemed to have endless energy diving into her art even after 8 hours of work. Her curiosity for surface design was boundless; she sought people out to learn new techniques. She jumped on the chance to learn the deconstructed printing I learned in a workshop. I came to appreciate her approach, because she played hard and developed a full bag of techniques and materials. She had a blast learning. Deb was the one I called on to take excursions, most recently to Vancouver and Maiwa. 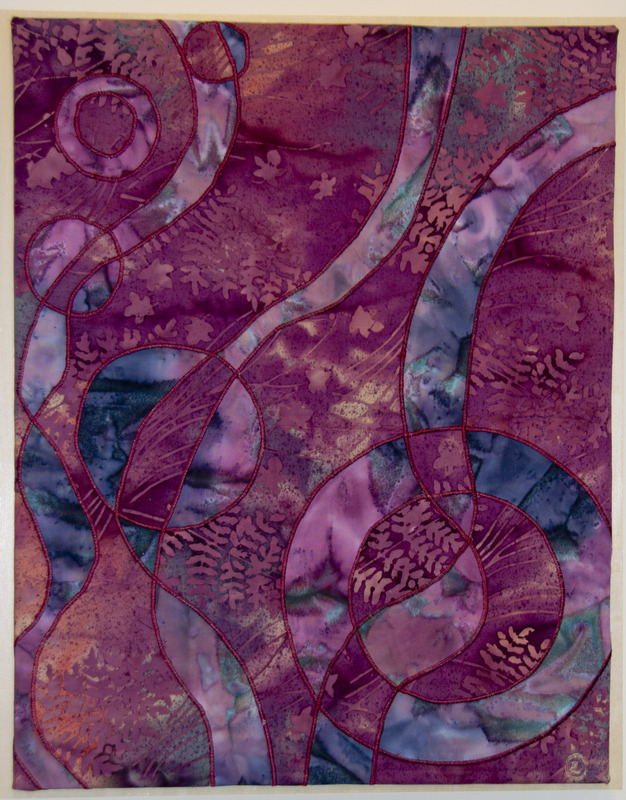 Another to a quilt show, where a skein of silk kimono ‘yarn’, which we split, enticed us to collaborate on art pieces. I miss being able to email or text Deb with new adventures. Our next venture was to Harbor Freight where we heard from friends at a recent retreat there were lots of interesting finds. I have lost my excursion buddy, but more than that, I am heartbroken to have lost the person who I realize now was my best friend in Seattle. Deb served as a SDA Seattle group leader for 2 years and also blog editor. Deb’s body carried her spirit as far as it could. I never heard her complain about her health, or broadcast how she was feeling. I was in the car with Deb and Bud in San Antonio in 2013 and she took a call on her cell phone that she’d been waiting for. So I heard her side of a conversation with a nurse doing intake for an experimental procedure in Philadelphia that she was considering. Since I’d heard that much, I was given the history and what they were likely to try next. Bud recited possible side effects with a determination that I later realized came from having held Deb through so much. Serenity Flower by Deb Taylor. Painted canvas with repurposed Silk Sari ribbon. A year ago, Jane Dunnewold suggested Deb as an addition to the critique group Ruth Vincent and I had formed. Deb had just spent a week in her multi-media class and wowed Jane with her creative spirit. Ruth and I were regularly treated to Deb’s lead-in of “it’s not much” and shown work that blew us away. If there was a new technique she’d seen, she was in it up to her elbows. That kind of pioneering spirit jolts you right out of your comfort-spot. My work comes from a place of internal and external positive energy. Deb helped feed that place. A big heart, calm presence, warm smile always. Generous of her time and energy. She provided an important context for me in the work I’ve been doing for the past year on aging and illness. If you didn’t see that she was ill, it is not because she was hiding it, or because you weren’t important to her. She chose to lead with the positive; strength, creativity, connecting with others. Bud’s been an incredible support to Deb’s artistry. It was clear Deb would seek his feedback on her work and valued it. 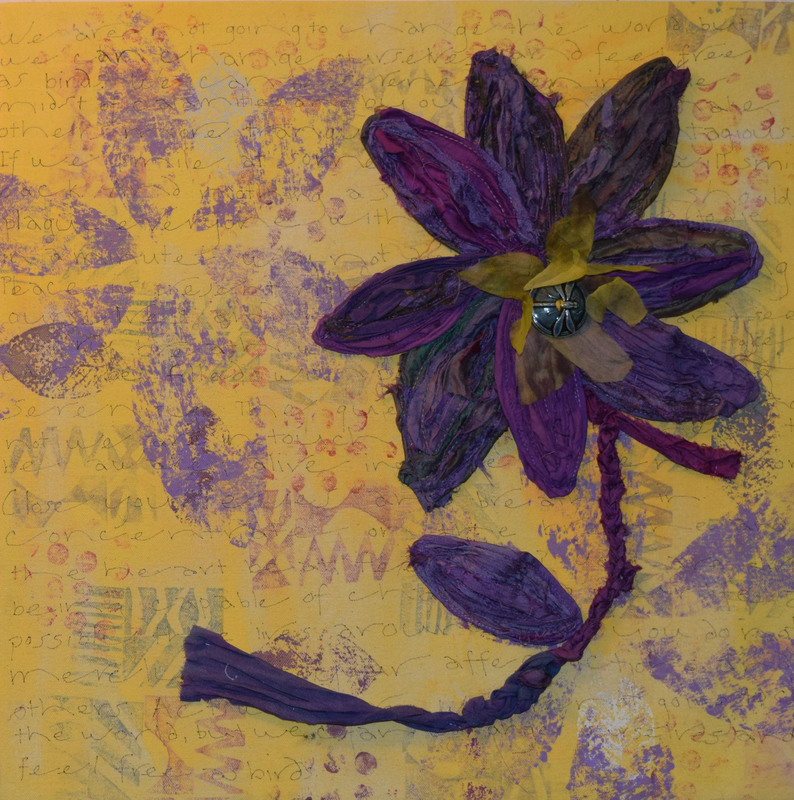 Her small “deconstructed” dyed and hand-stitched pieces are presented on unusual hard surfaces, with Bud’s help. When Deb lost her job and wasn’t getting any traction finding a new one, and Deb was discovering the joy of full-time “making art”, Bud encouraged her to make art her new job. 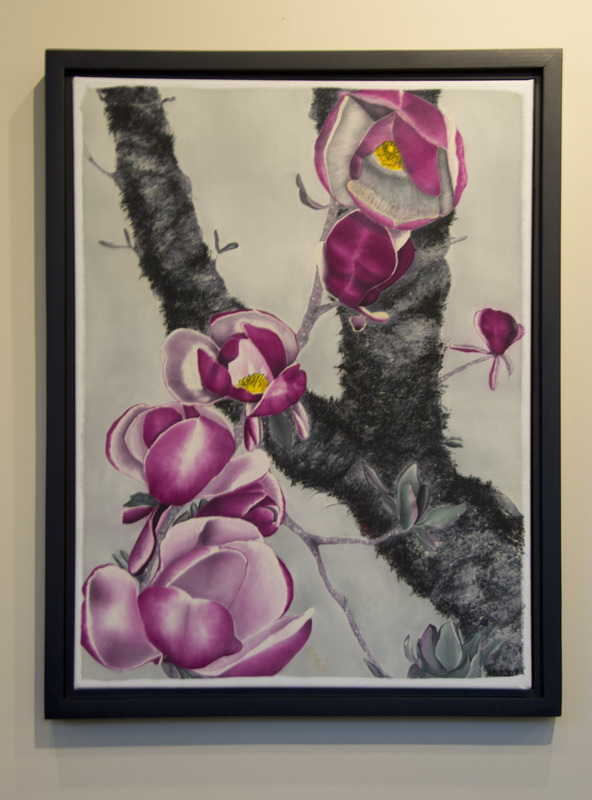 Deb’s major accomplishment this past year was becoming an exhibiting artist. It may sound like a natural progression, but it means a lot of hard work and determination. She was thrilled to be in several shows and especially to be juried into the CQA show recently at the LaConner Quilt and Textile Museum. It was a delight to see her shine when she and I took Jane up to see our work in the show this past spring. May her spirit live on. I received word on Wednesday, that a friend had passed away – suddenly and without warning. Two weeks ago she was at a retreat with me sharing laughs and art projects. One week ago, she emailed me and gently encouraged me to teach silk painting at a local college. Monday, she was chatting excitedly with a mutual friend about all of her exciting plans for the future. Tuesday night, she was gone. She was an inspired artist who dabbled in many different mediums (most of them fiber-related). She was always kind and had a gentle, loving spirit. She was a caring teacher and sharer of wisdom. She was a member of Fiber 19 and leader of the Surface Design Association (Seattle division). She was truly a lovely woman, whom I was privileged to call my friend. My heart bleeds for her family, and tears fall heavily when I think about all of the people whose lives she touched… whom I know will be missing her as much as I am. Looking through lens of the loss of a friend, makes me realize just how unimportant some of my worries have been. I know my bowls will get made, and the family war will work itself out. But not ever getting to share another laugh or piece of art with my friend… that cannot be changed. That is an incredibly sad fact. One that reminds me to cherish those around me that I love (even the ones currently driving me nuts!). Deb Taylor, you were my friend and I thank you for sharing a part of your life with me! You are missed, you are loved, and you are remembered with fondness and joy!